Monday April 6th 1896 It was quite a pleasant day. The boys were busy in the forenoon putting out some of the little pigs and getting the machinery read to sow oats. I did some baking and sewed all day on a black skirt I am making for myself. 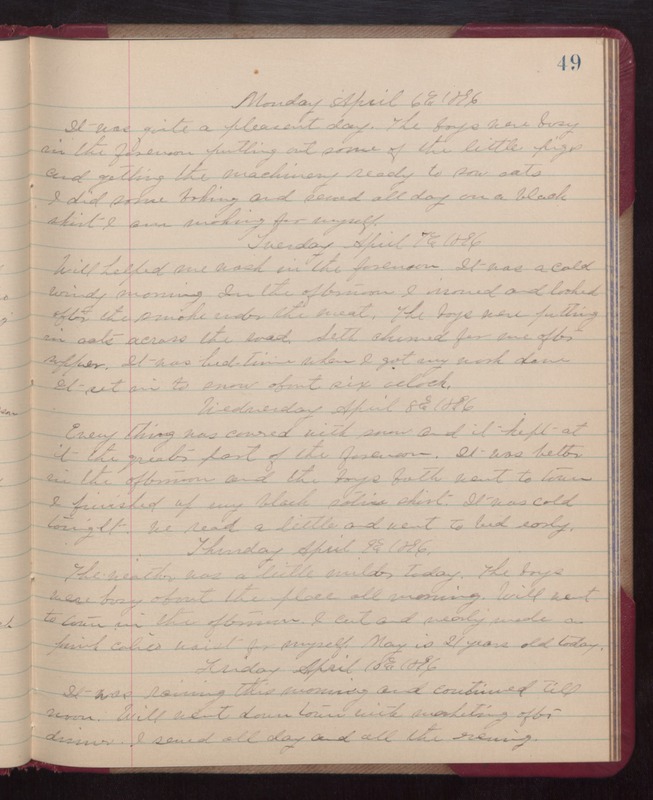 Tuesday April 7th 1896 Will helped me wash in the forenoon. It was a cold windy morning. In the afternoon I ironed and looked after the smoke under the meat. The boys were putting in oats across the road. Seth churned for me after supper. It was bed-time when I got my work done. It set in to snow about six oclock. Wednesday April 8th 1896 Every thing was covered with snow and it kept at it the greater part of the forenoon. It was batter in the afternoon and the o\boys both went to town tonight, We read a little and went to bed early. Thursday April 9th 1896 The weather was a little milder today. The boys were busy about the place all morning. Will went to town in the afternoon. I cut and nearly made a print calico waist for myself. May is 21 years old today. Friday April 10th 1896 It was raining this morning and continued till noon. Will went down town with marketing after dinner. I sewed all day and all the evening.